Martin Heidegger posited the idea that all criticism is existential and there is no impartial analysis outside of the experience of the reader. A reviewer of Evan Lavender-Smith’s From Old Notebooks asks: “Should the reader of F.O.N. expect the meaning or truth of the book to lie with its author? Does the truth/meaning of the book lie outside the book?” Furthermore: “There may be some question as to F.O.N.’s status as fiction, poetry, philosophy, nonfiction, etc. 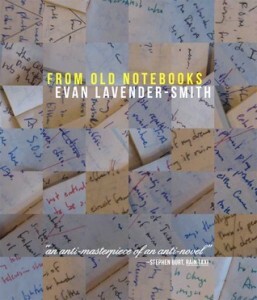 but hopefully there will be no question about its status as a book.” Both comments are from Evan Lavender-Smith critiquing his own book within the pages of From Old Notebooks, even revealing: “Why am I so averse to the idea of classifying F.O.N. as poetry? – Because poetry doesn’t sell.” That’s the way From Old Notebooks rolls, defying genre and classification, even defying the traditional boundaries of author and reader. On the exterior, it reads like a notebook filled with philosophical musings, hermeneutics, the germs of story ideas, dialectical exposition, hagiographies on dubious beliefs, aphorisms made ironic by their sincerity, and letters to death. But the flow of the notebooks is deceptively simple, appearing like a random collection of ideas when it’s in fact a journey through the Penrose stairs of Smith’s mind. I came across From Old Notebooks several years ago when it was first published by BlazeVOX. F.O.N. was one of the first postmodern/experimental works I’d read. Since then, I’ve read a lot more experimental works, some of my recent favorites including Robert Kloss’s The Alligators of Abraham; One by Blake Butler, Vanessa Place, and Chris Higgs; and Janice Lee’s Daughter. With F.O.N. recently reissued by Dzanc Books, I was excited about diving back in. It’s hard to analyze experimental works because the experience the reader has is so subjective and without making assumptions about the author’s intent, a huge part of the critique, for me, comes down to how the work resonates on a personal level. Explorations of infinity and thought stripped away from form involve literary techniques that are invented along the path of creation, and as a result, often defy formulaic definition. That is what makes these works so bold and compelling. Part of the allure of From Old Notebooks, then, is its accessibility. From Old Notebooks encourages interactivity and self-questioning. If I could think of an analogous project, (as different as they are) I think of a game called Warioware which is as close to experimentally interactive art as games can become. Short segments from various games pop up for a few seconds and then jump to the next section, most of the mini-games lasting a few seconds. What makes the game so much fun is that it draws from all the various corners of the history of gaming. It takes a erudite architect to design a game that’s both a throwback to other games while crafting its own distinctive identity. In the same way, if a less skilled writer had undertaken this book, it could have easily crumpled into random vagaries that go nowhere. Fortunately, tempo and diction are masterfully navigated by Smith to make the reading experience a sublime one that never feels disjointed or chaotic. This is not a somber work like Dostoyevsky’s Notes From the Underground with its depressing introduction: “I am a sick man… I am an angry man. I am an unattractive man. I think there is something wrong with my liver.” If F.O.N. takes inspiration from anyone, it’s Nietzsche, who also provides the opening quote of F.O.N. and wrote some of the most brilliant epigrams and aphorisms in works like Beyond Good and Evil and The Gay Science. There, he not only celebrated life and philosophy, but tore it apart and smashed it to pieces. In F.O.N., we get a little less smashing, but a whole new set of insights to the march of a celebratory romp that basks in life and its conundrums.